Here we are in the third week of It’s Not About You, a series where we’ve focused on popular stories in the Bible to clear up the lines that are often blurred and expose that the story is not about us, it points to something bigger. Today obliterated an analogy I’m sure many of you have heard, and some have even used, comparing the story of David and Goliath to significant problems we face in life. Before we delve into the arrogant narcissism hiding behind this comparison, let’s review this classic underdog story. Israel faced a stalemate in a war with the Philistines. The Philistines decided to propose a deal to end the conflict, allow the strongest warriors from each side to face off in a dual, the side whose warrior prevailed would earn ultimate victory. The Philistines nominated a borderline super-human named Goliath and waited for Israel to respond. David, a young shepherd who didn’t meet the minimum physical guidelines to join the army, delivered food to his brothers with an ulterior motive of bringing information of his brothers’ well being back to his father. While in the camp, David hears Goliath taunting the Israeli army and the Jewish God. Enraged by the insults slung at his God, David is compelled to act. He pushes through a wall of Israeli soldiers, denounces their cowardice for not standing up to this heathen, and demands King Saul allow him to represent his God and his country against the Philistine agitator. Refusing the typical armor and weaponry bestowed to a warrior, David entered the fight armed with a sling and a few smooth stones. With a flick of his wrist, David buries one of those stones deep into Goliath’s forehead, finishes the war by using Goliath’s own sword to behead him, then earns the right to marry King Saul’s daughter for securing Israel’s victory. The plight of David and Goliath is often alluded to when someone faces an arduous situation or a daunting task. We imagine ourselves in the place of David, and label the oppressor our Goliath. We’ve completely misconstrued the imagery by doing this. Goliath is not an obstacle to overcome, he represents ultimate evil; in a sense, he is Satan. As much as your ego would like to think, you are not David. David is the one man who stands against evil to rescue his people, David represents Jesus. Last, the Israeli army is not everyone around you who is not strong enough to handle your situation. You are the coward, trusting in your own ability and retreating in the face of your opposition. So what set David apart from the other, much more qualified soldiers that day? Passion. David’s passion for God, his dedication to reaching people and his vehement stand to face anyone who opposed his God. That was the secret to his success against Goliath. Today’s drawing provided an excellent opportunity to play with a new computer drawing program I purchased for a logo design project. I love how it turned out! 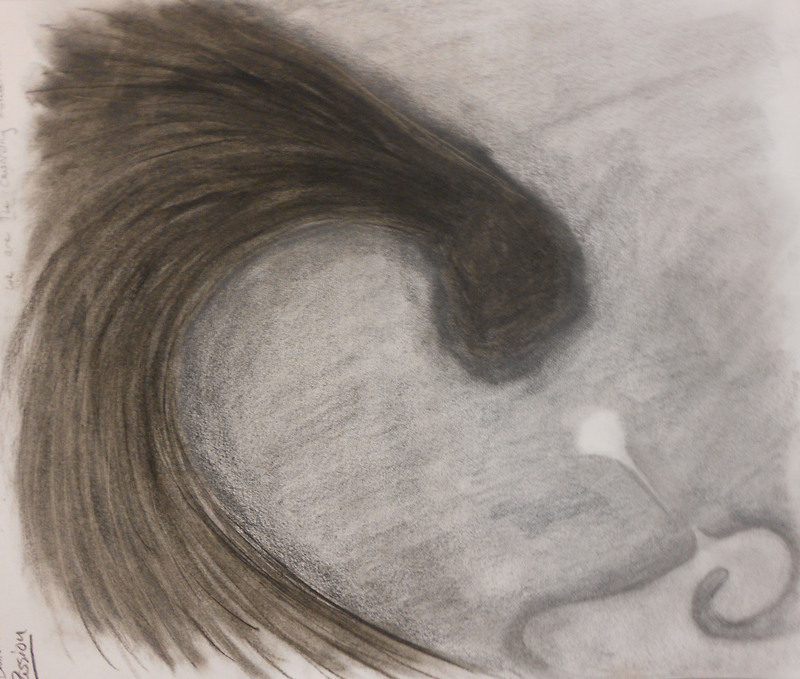 The ominous black wave is Goliath, a fist forms from the crest and threatens to pound its target. This wave is evil, God’s ultimate enemy. A small, yellow wave retreats into the bottom right corner in trying to avoid the beating that approaches, appropriately represented in a cowardly yellow hue. This wave is the Israelite army in the story, us in modern reality. A small spark of light splits off from the yellow wave, boldly standing between his people and ultimate evil. This was David that day for Israel, this is Jesus every day for us. You are not David, but you can take a stand. Both of these drawings are great! They perfectly illustrate your message! The drawing done on the computer is especailly nice too. Hey, have you ever thought about turning something like that into a t-shirt or a coffee mug? That black ominous fist with the golden wave and spark of light would be awesome! You might take a look at cafepress.com if you’re interested in something like that as a fund raiser. Seriously, I would be proud to have that design on a coffee mug to take to work. It’s the kind of drawing that could open up a conversation about faith and passion and the Gospel, you know? Plus it looks like something that a guy would have on a coffee mug (rather than lambs and flowers and thingks like that…not to knock those things but that’s the kind of image that would really resonate with a guy.) Thanks for your great work here! Excellent thought, John, thank you! I love the idea of the mug being a conversation starter!